My adult son with autism has a difficult time falling asleep. Hylands Calms Forte really seems to help! 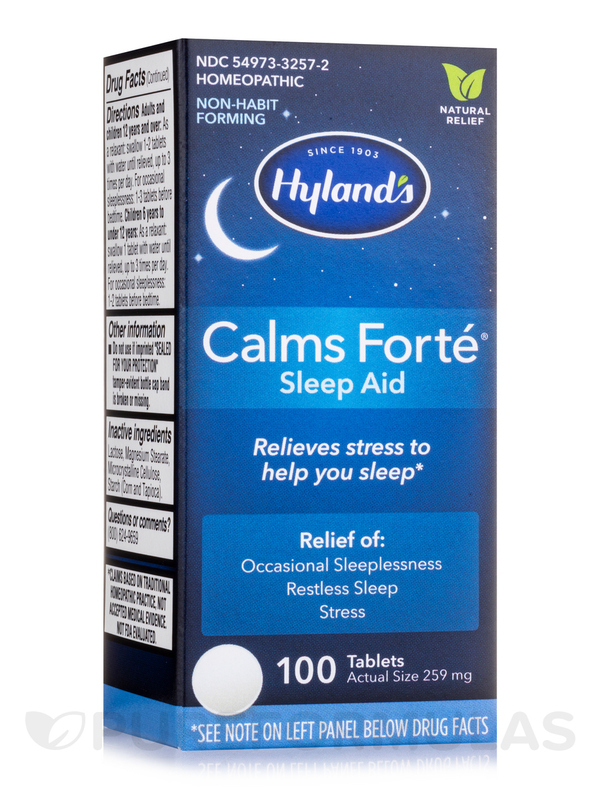 All days are hectic and settling down at night is hard to do, so Calms Forte by Hyland's is my calming secret. I use Calms Forte by Hyland's all the time it always helps.Very nice product and I am very happy that I discovered it for myself. Don’t even think about another bad night’s sleep. Your body is built to rest. Calms Forté® uses four homeopathically prepared botanicals to ease your body and your mind‚ plus six minerals to soothe nerves and edginess. There are no sedatives‚ so no next-morning drug hangovers. This natural and safe sleeping aid has helped people get their much needed ‘zees’ for over 50 years. • Temporary symptomatic relief of Nervous Tension and Occasional Sleeplessness. • Soothing formula eases tension and promotes sleep naturally. • Gentle‚ Safe and Effective. • All natural active ingredients. Avena Sativa HPUS 1x Double Strength / Stress‚ nervousness. Chamomilla HPUS 2x / Nervous irritability. Humulus Lupulus HPUS 1x Double Strength / Occasional sleeplessness. Passiflora HPUS 1x Triple Strength / Restless sleep from exhaustion. Biochemic Phosphates / Enhances cellular function. And the following biochemic phosphates for enhancing cellular function: Calcarea Phosphorica 3X HPUS‚ Ferrum Phosphoricum 3X HPUS‚ Kali Phosphoricum 3X HPUS‚ Natrum Phosphoricum 3X HPUS‚ Magnesia Phosphoricum 3x HPUS. 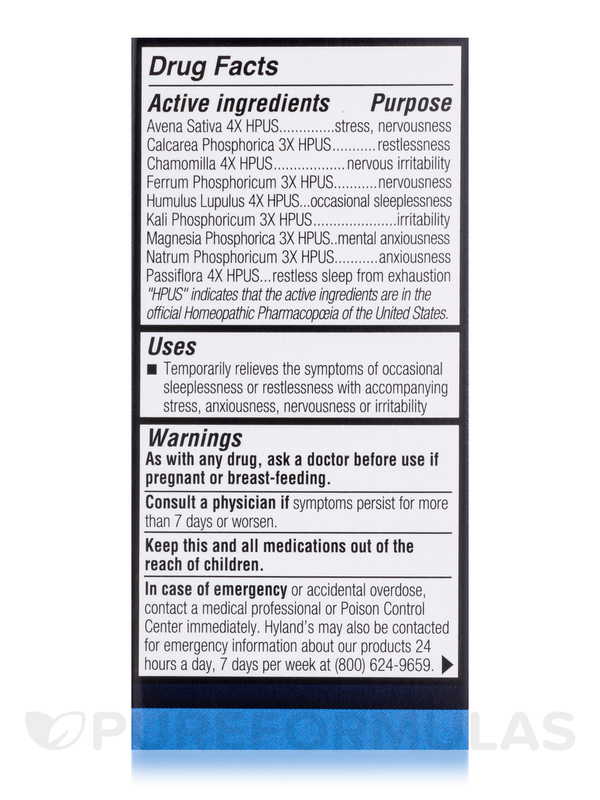 Adults: As a relaxant: 1 to 2 tablets with water as needed three times daily. For Occasional Sleeplessness: 1 to 3 tablets 1/2 to 1 hour before retiring. 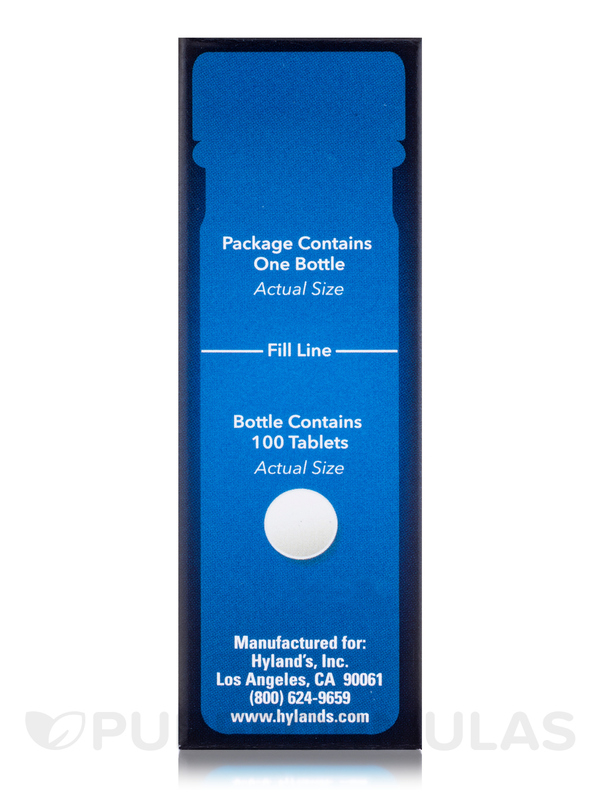 Children 6-12 Years 1/2 adult dose. Ask a doctor before use if pregnant or nursing. Consult a physician if symptoms persist for more than 7 days or worsen. Keep out of reach of children. Do not use if imprinted tamper ban is broken or missing. In case of accidental overdose‚ contact a poison control center immediately. 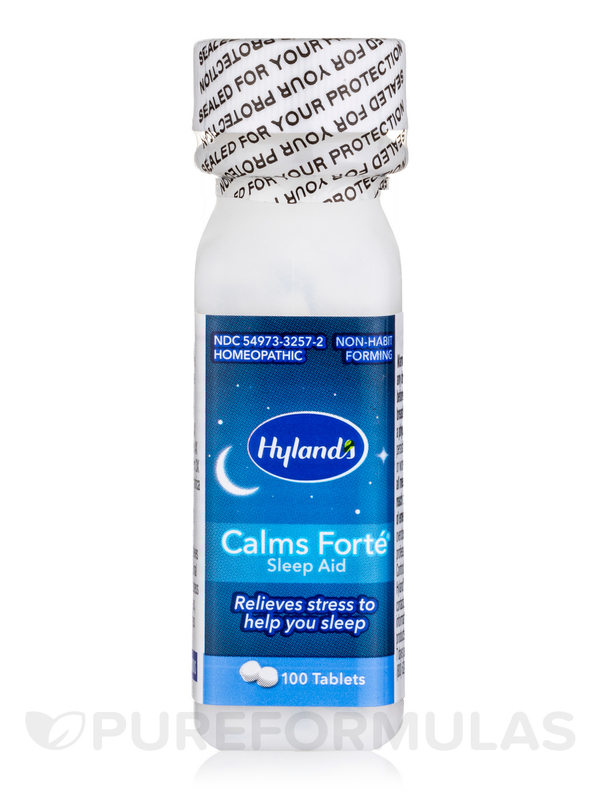 Calms Forte by Hyland's works great as a sleep aid! Puts me in a deeper sleep, helps calm the mind so you can sleep. I love this product! 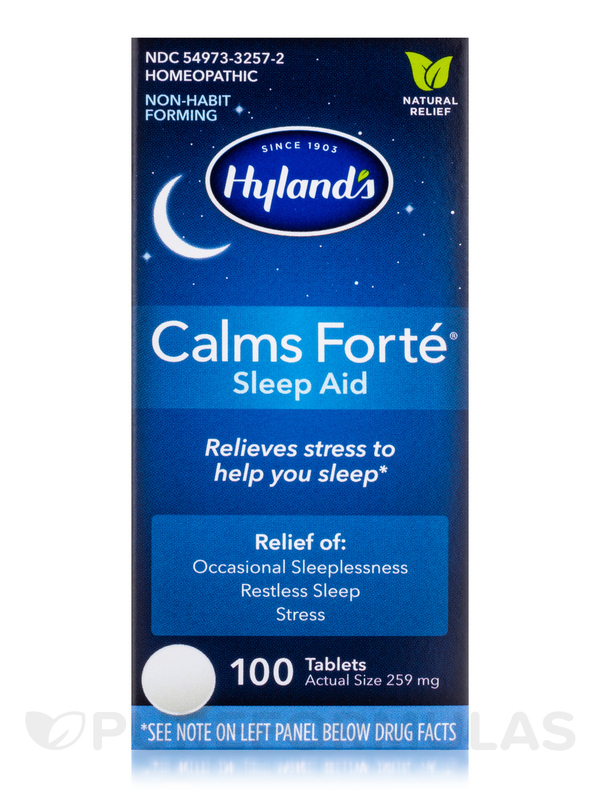 I just take three tablets of Calms Forte by Hyland's before bed and it helps me to get to sleep quicly and sleep for hours. I recommend this product. No nasty side effects is a huge plus. No side effects, Natural ingredients. I have used Calms Forte by Hyland's for a few years and really like it. It helps to calm me down when I am very nervous and get panic attacks. Not a cure for serious panic attacks, but it definitely helps to calm your mind. It also helps for social anxiety. It does what it says. May not be strong enough for very bad anxiety and stress. I love all Hylands brand line and personally I have a huge collection for many uses. 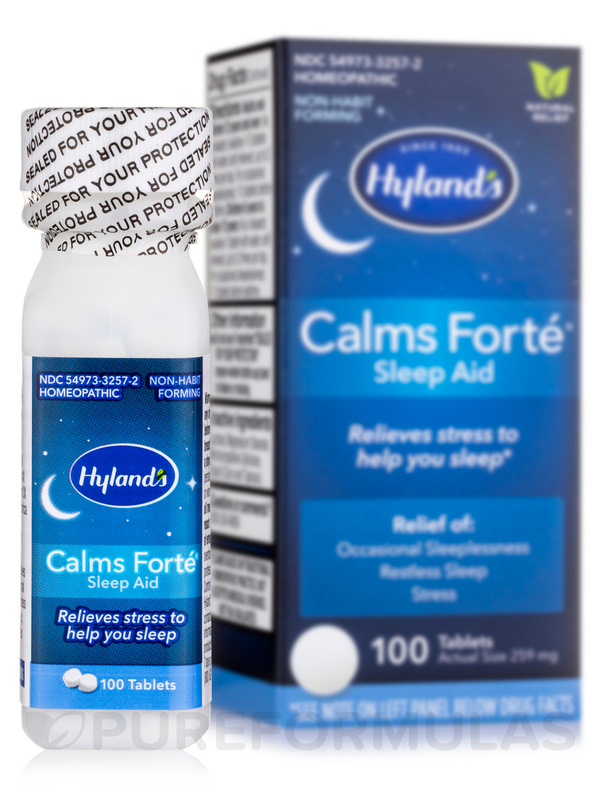 Calms Forte by Hylands helps me when I travel and can't go to sleep. It gives you a relaxed feeling to help you sleep and it doesn't make me drowsy. Pleased with Calms Forte. Helps to have a restful sleep. Going on two years using Calms Forte! Price, ease of use, effectiveness. This is the best product I have found for falling asleep with no side effects! shipped so fast wonderful company to work with! I will be back!